Lawrence Nulph, 87, Wyndmere, ND, passed away Wednesday, January 9, 2013 at his home in Wyndmere. The Funeral Mass will be Monday, 10:30 a.m., at St. John the Baptist Catholic Church, Wyndmere. Visitation will be Sunday, from 2 PM to 4 PM with a 3 PM Prayer Vigil at St. John the Baptist Catholic Church and one hour before the service on Monday. Interment will be at Elk Creek Cemetery, Wyndmere, at a later date. Vertin-Munson Funeral Home, Wahpeton, is in charge of arrangements. 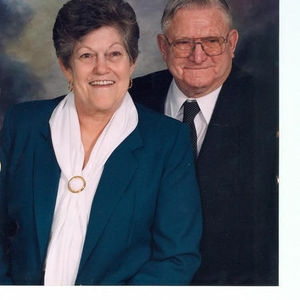 Lawrence C. Nulph was born September 28, 1925 at Wyndmere, ND, the son of Leonard and Clara (Domholt) Nulph. He worked on the farm with his folks until he entered the US Army. He served in Korea and wan Honorably Discharged in 1953. he worked for Anderson Service in Wyndmere for eight years and married to Margaret Freezon on June 10, 1954. They resided in Wyndmere until 1963, when they moved to Wahpeton. For 30 years Lawrence worked for the North Dakota highway Department. He later worked part time for John Ellingson and for General Machine Works. Margaret passed away December 29, 1998 and Lawrence moved to Wyndmere in 2000. Lawrence was currently a member of St. John the Baptist Catholic Church, Wyndmere, American Legion and Eagles. He enjoyed fishing, bowling and traveling. His favorite pastime was visiting and spending time with his children and grandchildren. Lawrence is survived by his daughter and two sons: Cynthia (Bill) Larson, Eagan, MN; Jeffrey (Lorna) Nulph, Clinton, Arkansas; Scott Nulph, Laramie, Wyoming; four grandchildren: Ambre (Pascal) Nulph-Fore^t; Nicole (Jason) Fogt; Melissa (Zach) Yarbrough; Dylan Nulph; two great-grandchildren: Hannelore and Kirsten; two sisters: Priscilla Krause, Wyndmere, ND; Shirley Marquardt, Fargo, ND; and a brother Darrell Nulph, West Fargo, ND. He was preceded in death by his parents, his wife Margaret; a brother Donald and a sister, Luella Danielson. Scott, Shirley and Priscilla and families - My thoughts and prayers are with you during the loss of Lawrence. Cindy, Jeff and Scott; My thoughts and prayers are with you. So sorry to read of your dad's passing on. My condolences go out to Lawrence's kids and the rest of the family. Sorry that I must miss the funeral.